The Ortlieb Rack Pack is a classic piece of luggage. It’s a universal holdall bag that has proved it’s versatility on every continent. The full-width roll closure allows fast access and keeps water and dust outside. The Rack Pack will fit perfectly into bike trailers and will carry everything you need to get you out riding! 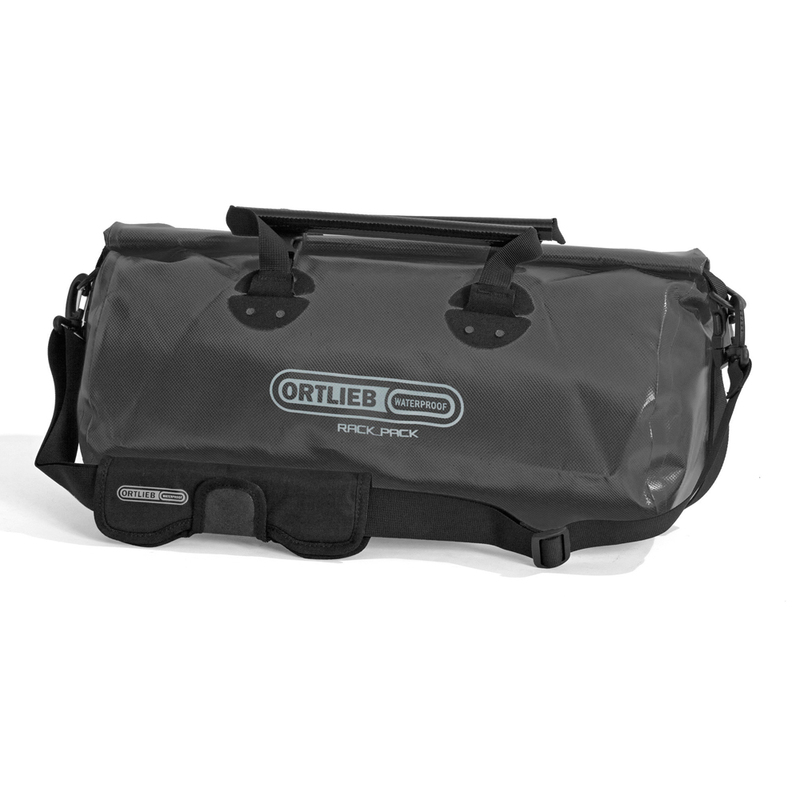 The Ortlieb Rack Pack Large is a multipurpose bag for many activities: sports (e.g. wet diving suits), travel, leisure, biking, motor biking, expeditions, canoeing, trekking and more! The Rack Pack Large can be Comfortably carried with adjustable padded shoulder strap and carrying handles. Used on the colored panels. As compared to the “Plus” fabric, this fabric is stiffer with a glossier outer finish. Highly durable, pvc waterproof inner and outer layers. Simple, effective and highly versatile means of protecting contents against dust and spray water from all directions. The roll closure gains it’s stability and waterproof quality from the thin plastic stiffener bars sewn into the upper end of the material. Height or volume of packed bags can also be reduced by rolling up the material further. 6 = Dust proof, no penetration of dust..
4 = Protected against splash water coming from all directions. Removable, padded shoulder strap with snap hook. Variable packing volume thanks to compression straps and roll closure. Easily accessible comfortable bag with wide opening. 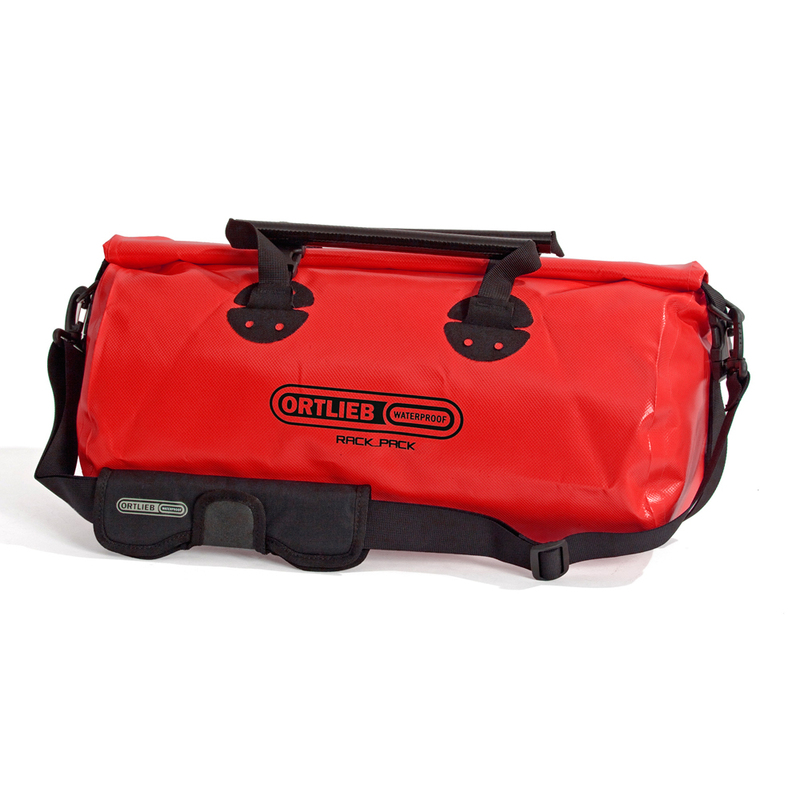 Typically used with ORTLIEB Back-Rollers and Sport-Rollers on top of the rear rack or stand alone. Everybody now has a clone of this bag but I chose Ortlieb because I think the PD 620 material is the best. I have been using a size medium but wanted more The medium is OK but too small for me. It has shown absolutely no wear after being lashed to my bike and carried on dozens of rides. I got rid of my Ortlieb Tourer panniers (90.7 ounces at 42 liters a pair) and now use only these bags strapped to my bike with wide straps for a significant weight saving. While the large rack pack alone has more volume than both panniers, I use the medium and the large bag (58.9 ounces at 80 liters total). Nearly 2 pounds lighter and nearly twice the volume. The slick attachment of Ortlieb panniers is nice but only a little better than my elastic straps.